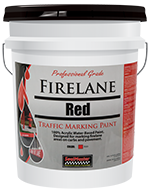 Designed for marking firelane areas on parking lots. 15 Mils wet film thickness (4″ wide stripe – 325 linear feet/gallon; 2″ wide stripe – 650 linear feet/gallon). * Colors may vary slightly from actual product. SealMaster® Traffic Paint is an acrylic water based paint formulated for striping exterior or interior asphalt and concrete surfaces. Stir thoroughly before using. Use as is. Thinning with water should not be required. Apply with spray equipment, brush, or roller to properly cleaned and prepared surface. Apply to clean dry surface when surface and air temperature is not expected to drop below 50°F or exceed 120°F in a 24 hour period. Wash tools in water before material dries.